Nebraska was founded under values of opportunity and equality for all, but when looking at the data and research on Nebraska’s children and families, a harsher reality is uncovered– one of disparity and lack of equitable chance of future success and opportunity for children of color. 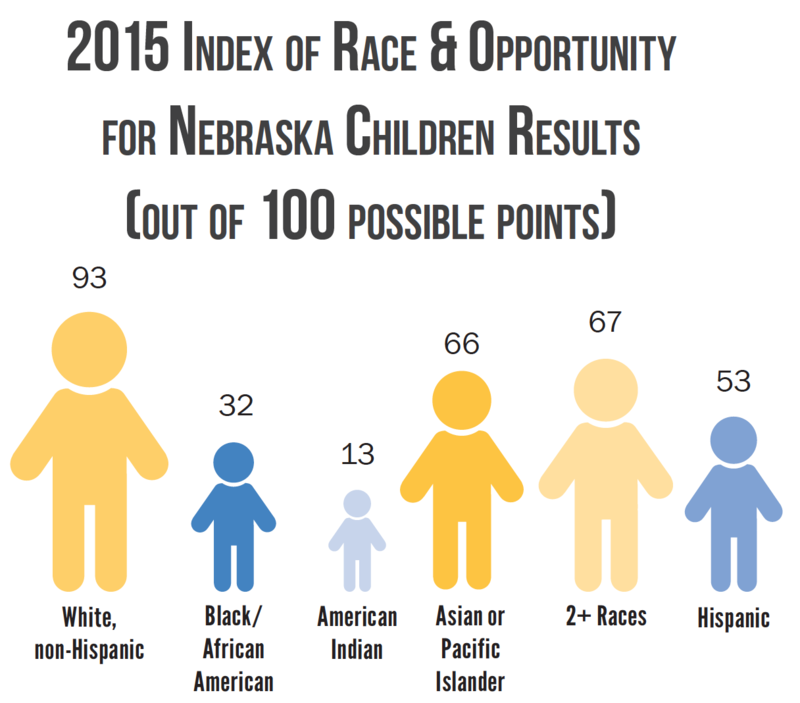 In response to this, the Index of Race & Opportunity for Nebraska Children was created. A composite score of 13 indicators of child well-being was calculated to highlight disparities in opportunity and measure progress toward race equity and inclusion. Establish an understanding of race equity and inclusion principles. Engage affected populations and stakeholders. Gather and analyze disaggregated data. Conduct systems analysis of root causes of inequities. Identify strategies and target resources to address root causes of inequities. Conduct race equity impact assessment for all policies and decision-making. Continuously evaluate effectiveness and adapt strategies. 1. U.S. Census Bureau, 2014 American Community Survey 5-year estimates, Tables C27001B-I.2. Vital Statistics, Department of Health and Human Services (DHHS). 3. U.S. Census Bureau, 2014 American Community Survey 5-year estimates, Public Use Microdata Samples. 4. Nebraska Department of Education. 5. U.S. Census Bureau, 2014 American Community Survey 5-year estimates, Public Use Microdata Samples. 1. U.S. Census Bureau, 2014 American Community Survey 5-year estimates, Tables B17001B-I. 2. U.S. Census Bureau, 2014 American Community Survey 5-year estimates, Tables B19113B-I. 3. U.S. Census Bureau, 2014 American Community Survey 5-year estimates, Tables B17001B-I. 2. Office of Probation Administration.